Born May 29, 1848 in Westerschnatebüll near Niebüll in Schleswig-Hostein (Gemany). 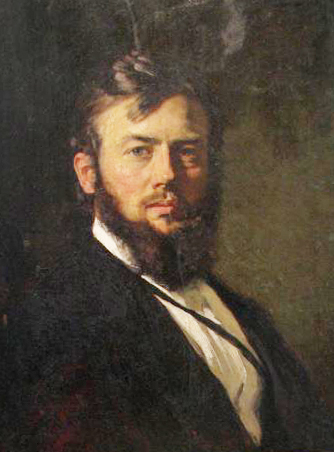 1868, begins his studies at the Academy of Arts in Düsseldorf. 1871, moves with some friends to the Art School in Weimar. Travelled to Poland (1873) and Italy (1877). 1879, married Margarethe Hansen from the Hof Gottesberg on the Kleiseerkoog near Niebüll. 1880, moved from Bad Kreuznach to Düsseldorf; then in 1885, settled down on the Hof "Weljtofrese" (I am happy here), near the Hof Gottesberg, today called "Feddersenhof". Lost his wife Margarethe on March 13, 1908; on August 29, 1909, married Sophie Lorenzen. Died on December 13, 1941 at his Hof "Weljtofrese". This collection of information about the painter Hans Peter Feddersen has been established in collaboration with Ethe Stubbe, Bärbel Manitz und Berend Harke Gloyer. The purpose of the collection is to make this information publicly available. This work catalogue is based on the list of paintings that appeared 1964 in the book "Der Maler Hans Peter Feddersen" by Ethe und Hans-Jürgen Stubbe. This information is complemented here with many Fotos from various sources. The work catalogue has been extended with paintings that have become known over the last years. I would be grateful for any indication about the works of the painter, including photos. Please send an email to me or to Bärbel Manitz (manitz-andresen@t-online.de - Postadresse: Hansastrsse 20, 24118 Kiel). I am one of the great-grandsons of the painter.